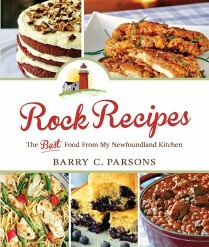 From RockRecipes.com creator Barry C. Parsons’ home kitchen to yours – Rock Recipes: The Best Food from my Newfoundland Kitchen gathers together some of the most popular dishes Parsons has ever posted – and includes a healthy serving of brand new fare as well! Linger over a decadent weekend brunch, tuck into family-favorite slow cooked suppers, or solve the weeknight crunch with Parsons’ foolproof thirty-minute meals. From Double Crunch Honey Garlic Chicken Breasts to Sticky Toffee Pudding and Coconut Cream Pie, Parsons’ own creations and adaptations of traditional recipes are triple-tested – and all come with Parsons’ signature Newfoundland twist!